You will be given a reference e-book to read which has 140 pages And the test will be based on that e-book , you can take final test within 1 year of purchase. Executive coaching refers to a well detailed process which is primarily designed to facilitate personal growth and leadership development with an aim of improving the performance of executives. It is a major help in leading clients towards fulfilling all their professional goals. Executive coaching also refers to the motivation training which aims to help corporate executives in enhancing their effectiveness and efficiency in the workplace. The executive coaching process encompasses elements and components of continuing education, essential concepts that allow you to determine the procedures involved in retaining enthusiasm for work and further exposure to various philosophies and ideas related to properly managing a business. Those who have undergone the process can expect to achieve the highest level of satisfaction in their chosen careers. If you want to become a certified coach in the field of executive coaching, then be aware that you first need to hone your motivational and teaching skills. It is also important for you to acquire excellent organizational and communication skills, generous dose of enthusiasm and interest for the specific subject that you intend to coach and excellent skills in accurately articulating essential information in such a way that your students or clients can easily understand. It is also important for you to obtain an executive coaching certification as this is a good way to attract more and more clients. Note that as a certified executive coach, you are also given the choice to conduct your sessions on a one-on-one basis or by conducting seminars and workshops with huge groups of executives. If you want to gather high quality and accurate information related to executive coaching, then enrolling in the executive coaching certification program offered by Brainmeasures can do you a lot of good. The executive coaching course which is now available at Brainmeasures is a huge help when it comes to molding you into the most reliable, knowledgeable and skillful executive coach. This certification course makes it a point to let you receive a kind of executive coaching training which can help you in fully understanding all the strategies and techniques that you can use when it comes to letting hundreds of professionals learn. With the help of the executive coaching certification course offered by Brainmeasures, you will get the chance to learn more about the different teaching styles that you can use as well as the many tools and equipment that are effective in hooking the interest of your clients and in letting them significantly boost their leadership skills. As soon as you receive your executive coaching certificate, you can start showing to the entire industry that you are one of the most skillful, effective and knowledgeable executive coaches at present. 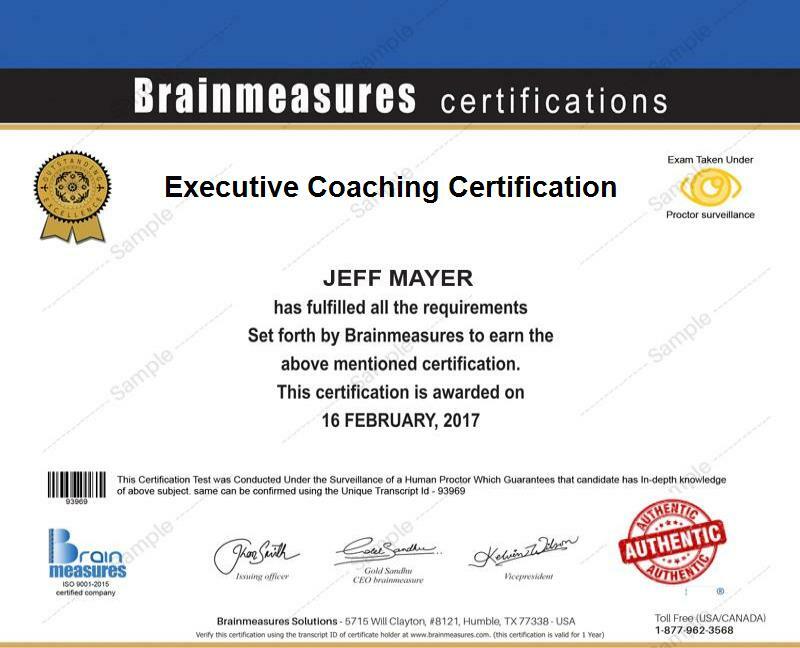 Accessing the executive coaching certification program offered by Brainmeasures and enrolling in it is a major help to a lot of people. You can expect it to work more suitably for anyone who wishes to understand what it takes to turn out into the greatest leader, talented and skillful management professionals who lack communication and leadership skills and established leaders who regularly experience burnouts and want to start receiving assistance in the field of handling personal crisis related to age and balancing work and life. Executive coaching certification holders are among those that are capable of enjoying a more profitable and flourishing career because of the higher pay that they can expect to receive. As an executive coaching certification holder, you can work as an executive coach consultant which lets you receive a salary of at least $86,000 annually. You can also work as an executive coach which offers around $110,000 to $132,000 per year. You may also find working as a business coach rewarding because this profession allows you to earn up to $140,000 yearly.